Small group ministry is becoming more popular in parishes across the United States, as it provides the faithful with an opporunity to deepen their sense of community within a parish and to deepen their relationship with Jesus Christ. And while the details vary from diocese to diocese and even parish to parish, the concept remains the same: A collection of people — all men, all women, close friends, couples, those who start off as strangers — meet regularly to share their experiences and to strengthen their faith in Christ and his Church. Small groups are “small Christian communities who gather (usually in private homes) to pray, share their faith and encourage one another,” said Father Dave Carrano, pastor of Sacred Heart Parish in Reedsburg, Wisconsin. The group’s conversations typically are facilitated by lay volunteers who ideally have had some sort of training. One thing that sets these groups apart is that they are not limited to a specific field of study or program, which allows for flexibility as well as an indefinite time frame. 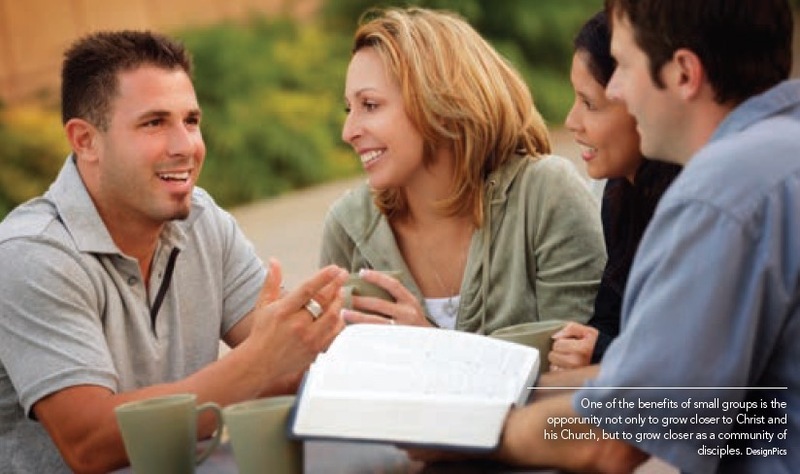 In many places small groups are seen as a way of evangelizing within the parish community, as well as an important supplement to the greater parish. “Small groups are much more able to meet people where they are at, whereas the large gathering at Mass is difficult to address everyone’s state in life and understanding of the Faith,” Father Carrano said. They are designed to facilitate openness, build trust and give people the opportunity to wrestle with the questions about their faith in a safe and encouraging environment. 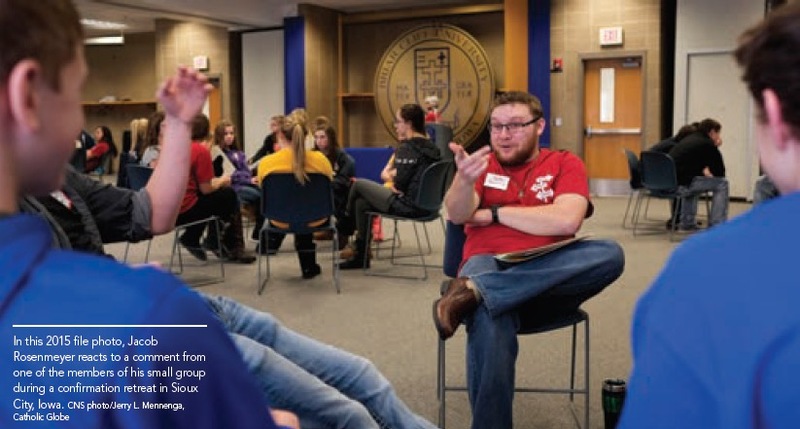 “Small groups are places where people can connect at a personal level with other people who are looking to grow or seeking to live out their mission,” said Justin Stroh, the director of parish life and evangelization at All Saints Catholic Church in Lakeville, Minnesota. Father Carrano typically sees an increased participation in Mass from those who join a small group, as well as greater engagement with others and a greater degree of comfort when it comes to living the Faith. “Small groups have helped many of our parishioners move from being passive and anonymous members of the parish to being an active part of the community,” he said. The parishioners of Sacred Heart Parish in Reedsburg, Wisconsin, have been affected profoundly by the introduction of small groups in their parish, said Father Dave Carrano. Here are the testimonials of two parishioners (both of whom chose not to use their last names). solidarity, and an “I thought I was the only one” revelation of sorts. Paulist Father Frank DeSiano is president of Paulist Evangelization Ministries and director of formation for his congregation’s seminary. Father DeSiano has served as a consultor for the U.S. Conference of Catholic Bishops’ Committee on Evangelization for more than a decade. He is a prominent supporter of small groups in parish evangelization, and he gives seminars and talks around the country promoting small groups and helping parishes establish them. Father DeSiano describes small groups as intentional clusters of people committed to meeting for religious purposes. These usually are under the auspices of a parish. 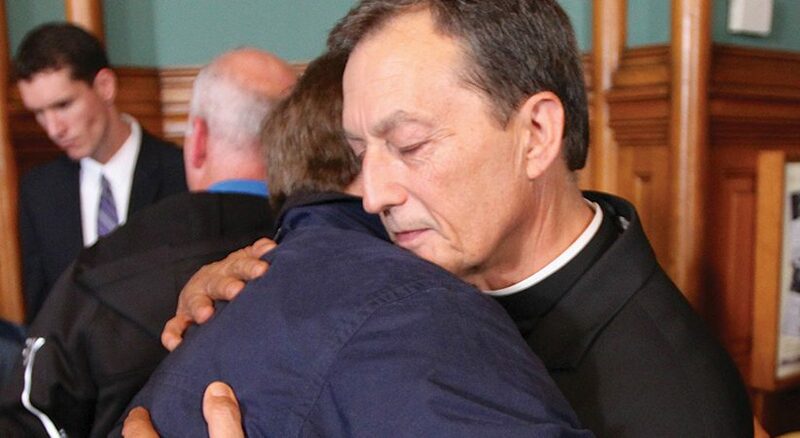 There are a couple of key words in Father DeSiano’s description: intentional and committed. Part of the point of a small group is that the individuals involved are there voluntarily and with the intention of growing in their faith and being held accountable in their spiritual life. The members of the group also are committed, as a group with a rapidly rotating roster would be ineffective in the context of faith sharing. A committed group of intentional disciples can be an effective method of evangelization. There can be many purposes of small groups, Father DeSaino said. They might be part of an ongoing movement; members might wish to share personal religious experiences and insights, usually based around Scripture; they may study Scripture or other documents of the Church; or they may have some other, particular focus. The groups intentionally are kept small in order to allow those participating to form close bonds with one another. But as the numbers of groups grow within a parish, it can be a challenge for priests and parish leaders to keep track of each one and, in particular, where there are openings for new members to come in and connect. Stroh says it is vitally important for the ministry at a given parish that is responsible for welcoming new members to have a direct line of communication with the facilitators of small groups, so that the new members can be connected with the small group community. As with any ministry at the parish level, it is important not to get too bogged down in logistical questions and end up forgetting altogether the ultimate point of the Church’s work: the salvation of souls. Mike Vievering, a colleague of Stroh’s at All Saints Parish in Minnesota, said there are benefits in the evangelization effort on the part of the parish that are unique to small groups. 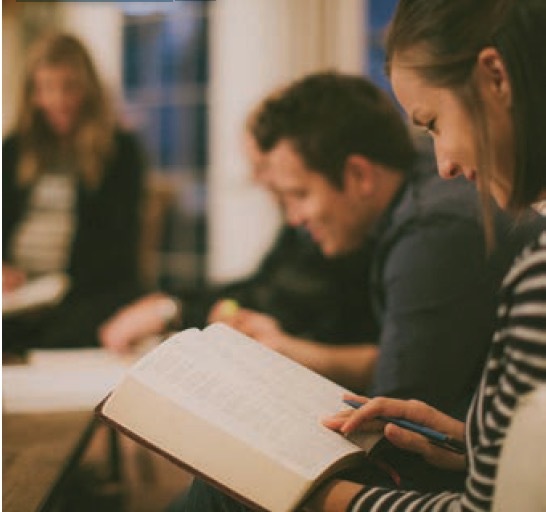 For one thing, the dynamic of the small group naturally compels members to engage with their faith and perhaps look at it in a way that they haven’t before. An important part of evangelization is an honest encounter with faith, and this is a necessity in the small group setting. Another benefit, according to Vievering, is that the way in which small groups foster evangelization happens in an ongoing way over an extended period of time. Many Bible studies or other parish activities operate best on a shorter time frame, perhaps a six- or 10-week course. But small groups are ongoing over an extended period of time, which allows for development of trust and a great deal of growth in the spiritual life. In Vievering’s experience, people even approach their faith differently because of the unique dynamic of small groups. “Jesus promised, ‘Where two or three are gathered in my name, there am I with them,’” Vievering said. 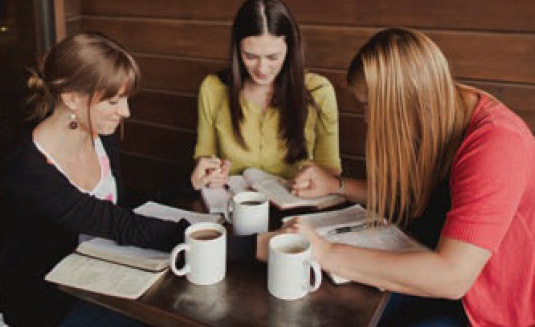 “Within the small groups, many encounter Jesus through the care, acceptance, insights and support they experience as members share about their lives, the truths of faith, and prayer.” Because of the way that groups are able to develop the faith life of members over an extended period, “faith tends to move more from the head to the heart and into daily living,” he said. Parish leaders agree that one major benefit to small groups is that, to many, they feel less intimidated by the more intimate setting, be it at a coffee shop, a friend or neighbor’s home, a community room tucked away within the parish’s campus or wherever the group feels comfortable meeting. These more personal settings might make those within the group feel more comfortable inviting others to attend their small group more than they would inviting them to Mass or another large parish event. “Initial trust can be built in a way that feels more natural in the small setting,” Stroh said. The very fact that small groups are as small as they are makes them appealing to many people and provides a wonderful opportunity to meet, greet, pray and learn about the Catholic faith for those who may not be comfortable approaching something in a large group setting. The dynamic of a small group allows people to open up and to say what is on their minds or what they have been holding in their hearts, Stroh said. In the world of education, it is common knowledge that there is a problem regarding class sizes, which have gotten larger over the years. Teachers who have 30 to 35 (or more) students in their classroom have a more difficult time giving sufficient attention to each student. Many feel the same can be said about large parishes. Father Carrano said small group ministry played a vital role in his own conversion while he was a student at the University of Wisconsin. While the benefits of small groups are deep and wide both for parishioners as well as the parish, practical challenges do exist. For one, as with many parish ministries, it isn’t always easy to find volunteers to step up and lead small groups. Father Carrano said the facilitators of small groups must be well-formed disciples themselves, and they need continual formation and encouragement. Still, Father DeSiano wants pastors and pastoral leaders to know that organizing small groups often can start with a simple invitation. “Leaders can probably, off the top of their head, think of five or six people who would be ideal in leading small groups,” he said. If a dozen or so individuals join each group, that is already more than 60 people involved in a new ministry. Another challenge comes when members of a small group have different perspectives on the particulars of the group — what to discuss, when and where to meet, who should be invited into the group. Solving these problems requires a facilitator to have skill, prudence and patience. “It is an art of accompaniment that some are better at than others,” Father Carrano said. Vievering said that one of the main challenges he sees is how busy people are these days, which makes them resist making the commitment to be in a small group. Additionally, the varied schedules among group members can be a major logistical challenge when trying to coordinate availability for meetings and other gatherings. It is important to work through such difficulties, as part of the point of a small group is to emphasize that time must be made for our relationship with God. 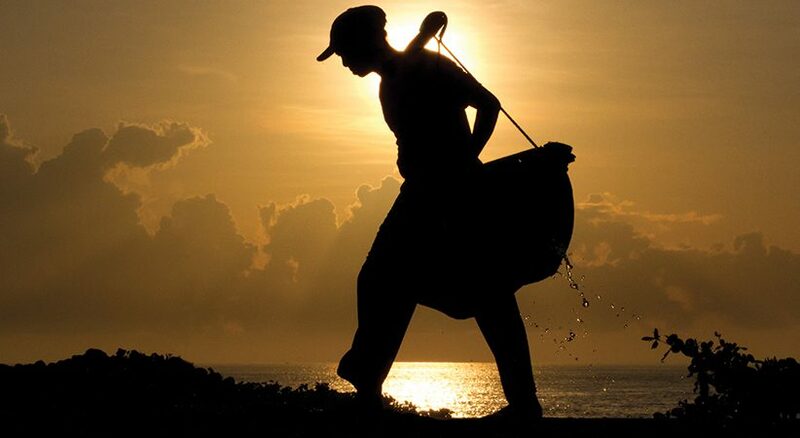 To do this we must put in the effort, which often means making sacrifices. If small groups are working as they were designed, Father DeSiano said, members of small groups should be eager to become leaders themselves, leading to an explosion of small groups sprouting off of an original. Therefore it is important to try to avoid the tendency for a small group to become insular and closed off. Jesus commissioned all Christians to go out and preach the Gospel, yet so many are painfully shy when it comes to speaking about their faith. Small groups can be a crucial steppingstone on the journey of discipleship and evangelization. Small groups can be an incredibly effective method of evangelization at the parish level. As with any ministry, a lot depends on the needs of the parish, the personalities of the parishioners, the social dynamic of the parish and a number of other factors. With all this considered, in many cases small groups are a profoundly moving experience for those involved, causing not only their relationship with Christ to flourish but, as a result, the parish to flourish as well. Father DeSiano considers small groups to be an indispensable facet of Catholic life today. “We can talk about discipleship all we want, but the greatest way to absorb the meaning of discipleship is through the small group experience,” he said. “Parishes that have small groups enjoy a high degree of energy and spirit.” This should not be surprising: When the faith life of parishioners is nurtured in a profound and energizing way, the parish will be revivified. provides prayers, reflections and discussion questions and gives links to online videos and daily challenges. To order, visit OSVCatholicBookstore.com. shaped the Faith. For pricing and other information, visit AscensionPress.com. “Catholicism: The Pivitol Players” (Word on Fire): Bishop Robert Barron gives a detailed biographical look at figures from the Church who propelled the Faith. Featuring episodes on St. Francis of Assisi (“The Reformer”), St. Thomas Aquinas (“The Theologian”), G.K. Chesterton (“The Evangelist”) and more, groups will see and study examples of those who truly have made enormous contributions to the Faith. For more, visit WordOnFire.org. “Presence: The Mystery of the Eucharist” (Augustine Institute): This DVD resource that explains the importance of the Eucharist is available in two editions — one for home study ($39.95) and one for a wider parish setting ($99.95). The videos feature dynamic speakers such as Edward Sri, Chris Stefanick and Matt Fradd, who detail what the Church teaches about the real presence of Christ in the Eucharist. Study guides ($15.95) are available in English and Spanish. Visit AugustineInstitute.org for more. “Why I Am Catholic (and You Should Be, Too)” by Brandon Vogt (Ave Maria Press, $20): In “Why I Am Catholic,” author Brandon Vogt shares his journey from a religious “none” to converted Catholic. Vogt gives a book-length apologetics lesson as he tackles questions frequently asked by athiests, agnostics and those from other faith traditions. For more information, including a free downloadable study guide, visit AveMariaPress.com. The message of the Sunday Mass usually is part of a five- or six-part series dealing with a unified theme. This theme is then deepened in the small group experience. Each small group is led by a parish-trained leader who follows a standard agenda: informal conversation, prayer requests, viewing the video, sharing on the questions, any practical items and a concluding prayer. “Grow Your Faith in a Circle” then moves into your daily life and sends you forward to the Sunday experience of the coming weekend, ready to hear the next message of the series and take it deeper. And so it continues each week. Small groups of many varieties are offered at Nativity. We have groups for couples, men, women, mixed adults, mixed young adults, singles, young women, new moms and couples with kids. Many groups of each kind meet morning, noon or evening. Small groups meet throughout the Baltimore area, and with the use of Zoom, a platform for teleconferencing, we even have online groups gathering with members from different states and countries. The possibilities are endless. Small groups bring the Sunday experience home, making it close and participative. And most of all, as the faith of individual participants is stimulated and grows, so, too, does their involvement in parish ministries. Yes, small groups are an extraordinary means to grow the faith and to grow the Body of Christ! — Father Nicholas Amato was ordained in 1970 as a priest of the Archdiocese of Baltimore. He retired in 2017 and is a member of Church of the Nativity in Timonium, Maryland, where he is in leadership of the parish’s small group ministry.